Born in San Salvador, lives and works in Philadelphia. From a family of artists with diverse media including graphic design, Brazilian percussion, oil painting, and cake-making. He holds a degree in Fine and Visual Arts from the Centro Nacional de Artes (CENAR) and a degree in graphic design from Don Bosco University. After becoming frustrated with the exclusivity of the San Salvador gallery scene, he began to define his own street art style. His colorful pieces portray the vibrant Latin American culture and mirror the sounds, roots, and forms of the urban-tropical lifestyle. 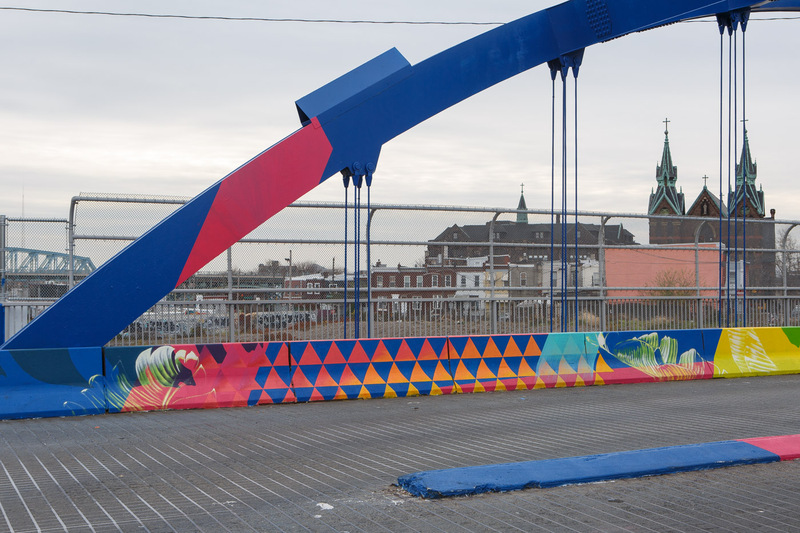 On the B Street Bridge in Kensington, this new mural from artist Carlos “CALO” Rosa reflects the hopes and traditions of the community, mixing lively colors and shapes with floral patterns to create a bright passageway from Gurney Street to Tusculum Street. The mural is also a metaphor for the connection between past and present, a theme that came up in discussions with local seniors. 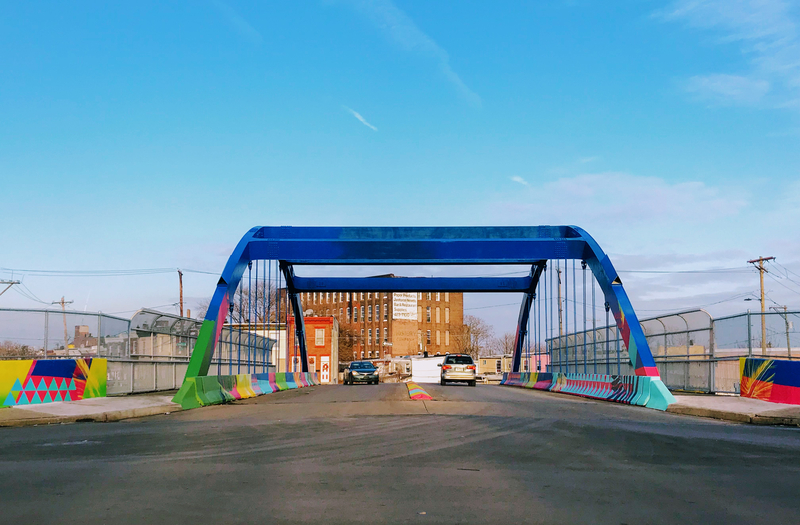 Transformation Bridge was painted with the help of the Restorative Justice YVRP Guild and members of the community and is part of a larger body of work in Kensington. The neighborhood around the bridge has persevered through challenging times with great strength and resilience, driven by a collaborative and empathetic spirit. Veröffentlicht in contemporary art, Drawings, Graffiti, Murals, Projects, street art, urban artBookmark the permalink.